If you’d like to make this vegan, replace the honey and unsalted butter with agave nectar and olive oil respectively. The carrots were briefly simmered in lightly salted water for 4 minutes, then seasoned with olive oil, sea salt and black pepper and roasted for 20 minutes at 350 F. The morels were fried in melted unsalted butter over medium heat, with and until tender, and lightly seasoned with sea salt and black pepper. 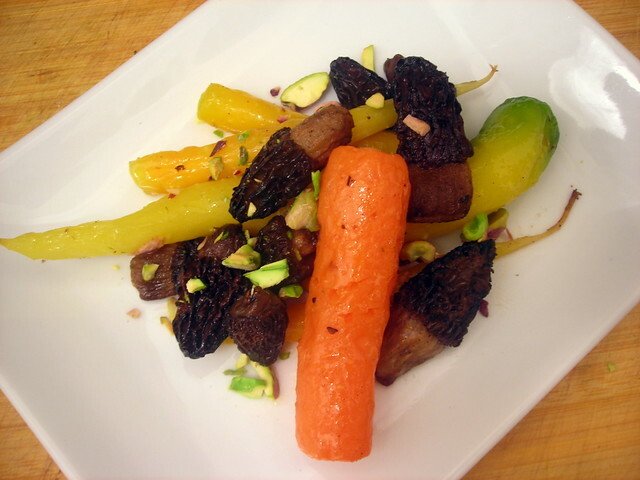 Both the carrots and morels were lightly dressed with a mixture of 1 tablespoon white wine vinegar, 2 tablespoons Belgian-style beer, 1 teaspoon honey and 2 tablespoons extra-virgin olive oil. You’ll notice that the carrots are whole — that’s because I wanted to serve them by preserving their unusual shape, instead of slicing them. You can skip the par-boiling step, but if you do so, you’ll have to adjust the roasting time. As pictured, this is sized for one person. 18 May	This entry was published on May 18, 2013 at 8:28 pm. It’s filed under American cuisine, food, food photography, spring, Union Square Greenmarket, vegetarian and tagged American cuisine, appetizer, carrots, food photography, morels, spring, vegetarian. Bookmark the permalink. Follow any comments here with the RSS feed for this post. ciao! just the best recipe.